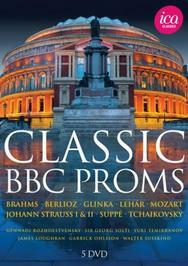 This set presents some exceptional performances given at the world famous BBC Proms festival. It features piano virtuoso Garrick Ohlsson, Russian maestro Yuri Temirkanov, Gennady Rozhdestvensky, who has had a strong association with the Proms throughout his career, and Sir Georg Solti with his much-loved Chicago Symphony Orchestra. The set also comprises the compilation DVD �Viennese Night at the BBC Proms�, which brings together the greatest Viennese classics performed at the Proms festival. American pianist Garrick Ohlsson won the Chopin Competition in 1970 and is at the height of his powers in Brahms� challenging Second Piano Concerto. Internationally acclaimed music writer Jeremy Siepmann wrote that Ohlsson�s performance is �subtle, brilliant and generous�. The Viennese Night concert has been a tradition at the Proms since 1947 and its audience�s enthusiasm rivals that of the Last Night. Classics featured on this DVD include the Blue Danube Waltz, the Radetzky March, the Csardas and �Laughing Song� from Die Fledermaus, conducted by Viennese music specialists James Loughran and Walter Susskind. The DVD of Gennady Rozhdestvensky conducting two of his favourite composers, Glinka and Tchaikovsky, was unanimously praised by international music reviews. Daniel Morrison at Fanfare highly recommended the viewing while R�my Louis at Diapason magazine awarded it a Diapason d�or and said it was �irr�sistible�. Representing the first visit to the Proms by the St Petersburg Philharmonic Orchestra (ranked among the top 20 orchestras in the world by Gramophone), this exhilarating concert from 1992 sees the orchestra on top form. Temirkanov�s profound love of Tchaikovsky�s music is evident in this passionate interpretation of the Manfred Symphony. According to Dan Morgan at MusicWeb International, this DVD is �an indispensable record of a memorable night�. This set also features the final concert of Sir Georg Solti and the Chicago Symphony Orchestra�s European tour in 1985. The alliance between Solti and the CSO lasted for over 20 years and was revered among audiences and critics alike. Andrew Achenbach noted for Gramophone (August 2013) that �Solti�s art combines grace, tender affection and urbanity to the most agreeable effect� during a 90-minute concert that featured Mozart�s Symphony No.39, Tchaikovsky�s Symphony No.4 and Debussy�s F�tes. Eye-catching packaging combined with stunningly low pricing makes this 5DVD set an unmissable bargain.